Students are not reborn every September. They are not new to education or to subject-area content. Their desire to learn is innate. While students may get a “clean-slate” each September and have the opportunity to make a new first impression, they are, in fact, the same learner they were the year before. They have the same needs, the same perception of learning and school, and the same eagerness (or perceived lack thereof) that they had on the last day of school the previous year. Why, then, do we feel the need to re-identify what students need to learn and how they need to show their learning? Why do we hear comments like, “they should have learned this in grade x” as if educators are then absolved of ensuring that skill or content in question was acquired? What if, instead, curriculum and instruction were so vertically aligned that teachers were able to take evidence of student proficiency and academic behavior from years past, and use that data to immediately start filling in gaps and advancing learning right from day one? How might this approach affect student learning? How might teachers be better able to differentiate? While this may seem unrealistic, it doesn’t have to be. By using the information we can garner from high quality assessment and tapping into the power of vertically aligned learning progressions, moving individual students along appropriately can become educators’ reality. We are doing students a disservice if we are not intentional about the progression of their learning. What Hattie and Wormeli both describe is another way to differentiate via learning progressions. Learning progressions should be regarded as a fifth way to differentiate in addition to the four generally accepted categories (content, process, product, and learning environment) in which we can differentiate for students (read more about these categories here). Students need to be viewed as individuals who have different needs that must be met in a particular order for them to be successful. This means teachers will be inclined to vary the type of differentiation they employ rather than just choosing to differentiate “content” or “product” for any given assignment. This leads us to our next point. For differentiation to be effective, it must be targeted to both the student needs and learning progressions. A popular method of differentiation by many educators is “student choice”. Typically, teachers offer students a variety of options and students choose the one or some that they like best. While we wholeheartedly support giving students choice as this builds ownership in the learning process, all choice is not created equal. For instance, I (Lisa) gave my children a choice for dinner last night. I was tired, rushed, and didn’t feel like cooking. So, I gave them a choice of McDonald’s, Burger King, or Wendy’s. While they may have voted me “mom of the year,” I certainly didn’t offer them the best choices for their nutritional needs. Similarly, we sometimes we offer students choices that are not appropriate for their needs and may even muddy the learning process when the learning intentions are not clear. 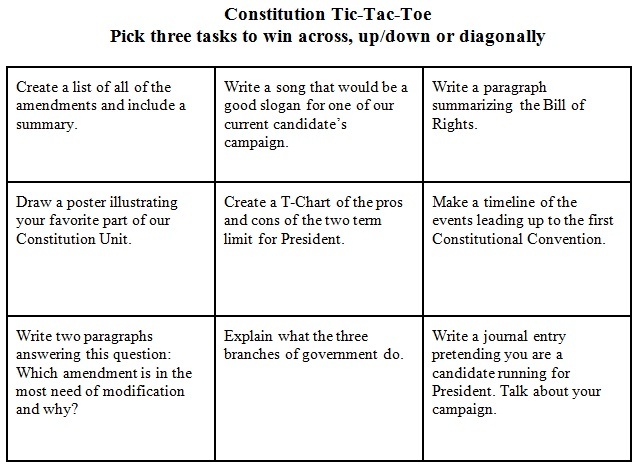 Take, for example, the tic-tac-toe style choice board that many teachers give students. Students get to “choose” learning activities based off of their personal preference, not necessarily their need. For teachers, this may seem like differentiating, but, without a targeted goal, action plan, or progression, students are just working to complete different tasks, not necessarily growing. While some of the tasks on this choice board may meet the needs of certain students, the likelihood that students will choose the three in a row (assuming the boxes are aligned) they need to grow academically, is improbable. 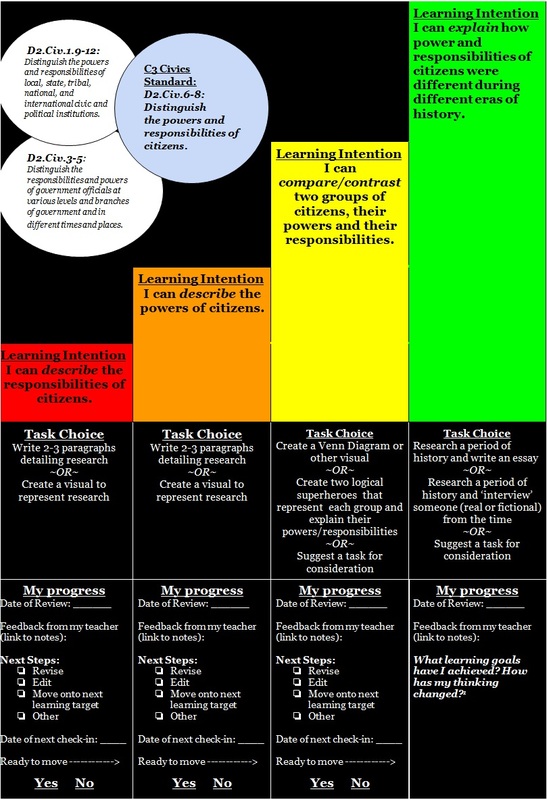 Additionally, the idea that a student would be able to clearly understand the learning intentions and success criteria (Hattie) from this choice board is equally improbable. So, what do we suggest? By considering student need in addition to student choice, teachers can better ensure they are effectively differentiating to affect growth in their students. What is the learning intention for this lesson/unit? What prior knowledge do students need to complete this? Where do they need to go next? How do I know this? How will students know where they are going and how to get there? How will I provide feedback? How can I incorporate choice? How can students suggest options which demonstrate their learning? How will the students know if the success criteria has been met? How do you use learning progressions to differentiate for your students? We would love to hear other suggestions that help best meet the needs of our students. You can connect with us on Twitter @lisa_westman and @stephlarenas. Great article, Lisa and Stephanie! Thank you for pointing out the differences between student choice and differentiation. I think many teachers get confused by the purpose of these two important aspects of learning. Student choice inspires and engages students so that they feel a sense of ownership, autonomy, and meaning in what they are learning– all of which support academic achievement. As you make clear, differentiation is not necessarily about engagement but more about meeting students’ individual needs. Thanks for highlighting these distinctions. Thank you for this detailed and thoughtful response, Robert. You’re the best!